Oh “Iron Man 3,” what a disappointment you are. I am going to be perfectly honest here. I loved Phase 1 of the Marvel Cinematic Universe. Every film in it was enjoyable — “Iron Man,” “The Incredible Hulk,” “Iron Man 2,” “Thor,” “Captain America: The First Avenger” and “The Avengers.” However, after seeing the latest Marvel offering, I fear that the success might be going to their head. It is hard to go too far in to my exact problems with the film without spoiling anything, but I will do my best to toe that line here. 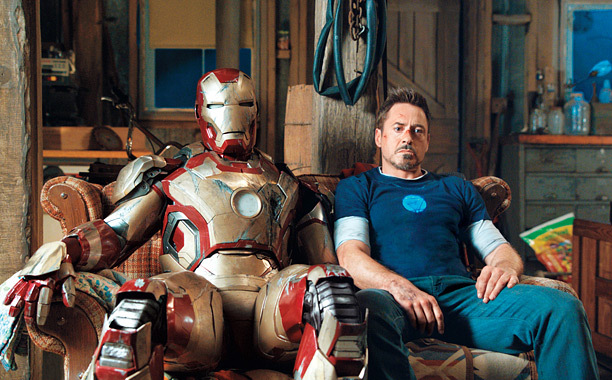 “Iron Man 3” picks up not too long after the events of “The Avengers” took place. Tony Stark (Robert Downey Jr.) is a different man. Everything that happened in New York has him beaten down. He has flashbacks to his near death experience that allow this film to have some real heart. All Stark wants is to protect his love Pepper Potts (Gwyneth Paltrow). The upside of this film is Downey. He can play this role in his sleep at the point. I would venture to say this film gives him more of a chance to show off his way with one-liners than his previous three outings as Iron Man. Part of that could be because of the new addition to the franchise, director Shane Black (Kiss Kiss Bang Bang). The film definitely has Black’s signature tone, reminiscent of his work in the “Lethal Weapon” franchise. At times, this greatly helps the film, such as in a series of interactions between a down on his luck Stark and a kid he comes across. The kid cannot be more than 12, but Stark treats him like an equal, greeting him with the same sarcastic and irreverent tone that he would greet any adult. However, Black’s desire to go for the comedy goes too far at particular points of the story. Not that a comic book movie cannot be fun, by their very nature they should be, but the way in which Black seems to put a possible laugh above what should be more important — the story — hurts the film. Without venturing into spoiler territory, the biggest issue of the film revolves around the villains, the Mandarin (Ben Kingsley) and Aldrich Killian (Guy Pierce). The Mandarin is a menacing anti-American terrorist, who in Osama bin Laden fashion likes to make videos to warn his least favorite country of pending attacks he is planning. Killian is a character who in some ways is reminiscent of Sam Rockwell’s character in “Iron Man 2.” He also wants to build an army, but his is of super humans, rather than robots. The characters are set up well initially and for about the first hour of the film everything makes sense. However, at the one-hour mark the film presents a very divisive twist that some viewers will not mind, while other viewers, like me, will immediately be taken out of the movie. I am not a comic book purist by any means. I have never gotten too deeply involved in the source material of the genre, though I adore comic books films, so that is not the issue here, for me. The issue is that the film drastically changes the audience’s perception of a character in a way that does not help the storyline. It only hurts it. Ultimately, it is the story that lets this film down. The action is well-shot and fun to watch. For fans who love the Tony Stark character, there is plenty to enjoy. But for those looking for a film that can be a worthy successor to “The Avengers,” this is not it.